The government of India recently aired half-page advertisements in the newspapers, featuring corpses with boxed names and a declaration that “Naxals are nothing but cold-blooded murderers". Around the same time, the home minister began to talk about an imminent counter-insurgency operation in Chhattisgarh and other states. This, the home minister explained, was the government’s concerted response to the violent challenge posed by the Naxals to state authority. As a token of the seriousness of the state, he revealed that the paramilitary forces involved in the action would be allowed to call upon the special operations units of the Indian Army and the helicopters of the Indian Air Force for logistical support. The advertising campaign, the home minister’s bid to prepare us for the intensity of Operation Green Hunt, the reports that some 75,000 paramilitary personnel had been mobilized, suggests an operation planned on an unprecedented scale. For perspective it’s useful to remember that the current strength of Nato forces in Afghanistan is just under 100,000 soldiers. The deployment indicates that the government of India sees the Naxalite insurgency in Chhattisgarh and elsewhere as a menace comparable to the terrorism of the Taliban and its sponsorship of jihad. This is consistent with Prime Minister Manmohan Singh’s much-quoted statement that violent, Left-wing insurgencies are “the gravest threat to India’s internal security". This should remind us that large counter-insurgency operations in India have so far been confined to India’s borderlands and directed against secessionist movements: Punjab, Kashmir and the North-Eastern states are cases in point. Operation Green Hunt, on the other hand, is to be staged in central India in a poor, rural, landlocked province surrounded by six other states. 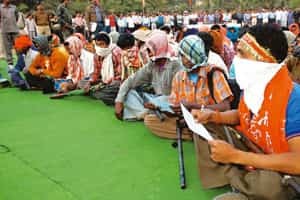 The government of India argues that large parts of Chhattisgarh, indeed scores of districts spread over a dozen states, have, in fact, seceded from India; that Operation Green Hunt is needed precisely to reassert the first responsibility of any state, its sovereign control over its territory. Put like that, Operation Green Hunt seems like a justifiable initiative. How can the Indian republic call itself a State if its writ doesn’t run in its heartland? In the first round of television discussions after the home minister announced his counter-insurgency plans, anchors and moderators asked the critics of Operation Green Hunt the obvious questions: What choice does the Indian government have when its authority is usurped by insurgents who reject the legitimacy of a democratically constituted state? Isn’t the liberal, civil rights critique of insurgency naïve at best and treasonous at worst, given that it limits the government’s freedom of action and challenges its legitimate authority at the very moment when its energies should be focused on defeating those who would subvert it? There are two ways of responding to this rhetorically powerful argument. One is to say that a citizen’s or a pundit’s brief isn’t, and shouldn’t be, limited to articulating reasons of state. Instead of ventriloquizing for a government perfectly capable of getting its message across (think of the half-page newspaper advertisements), commentators, reporters, even television anchors, could put their skills to better use by exploring the predicament of those likely to be collateral damage in this war, who don’t routinely command the headlines or prime time: the rural poor of Chhattisgarh, Jharkhand and Andhra Pradesh and every other state and district where insurgency feeds off the desperation of violently exploited Indians. A perspective on Operation Green Hunt that concentrates on the costs of counter-insurgency (always borne disproportionately by the poor) might give us something to set against the government’s justifications for this war. Adversarial journalism, far from being treasonous, is the mark of the patriot: If more American journalists and intellectuals had been sceptical of George Bush’s reasons for the invasion of Iraq, both the US and Iraq would have been spared a murderous, catastrophic and futile war. The second way of testing the government’s good faith in setting in motion this massive confrontation is to examine the consistency of its own arguments. The home minister’s primary justification for Operation Green Hunt is that the State can’t allow its authority, its monopoly over violence, to be flouted with impunity. This begins to seem less plausible when a cursory survey of Chhattisgarh’s recent history reveals that the Congress party in that state pioneered the strategy of raising and arming a vigilante army (the Salwa Judum) whose members were given special police officer status and granted the leeway to kill pretty much whoever they wanted in the name of anti-Naxal operations. The Salwa Judum wasn’t just criticized by liberals, civil rights-wallahs and the usual bleeding heart suspects: It was censured by the higher courts of the republic. The Congress government at the Centre has now backed away from its sponsorship of this mob, but it’s worth remembering that a government that claims to be so mindful of its monopoly over violence that it will go to war against those of its citizens who would challenge that monopoly, shouldn’t have been in the business of subcontracting its licence to kill to civil society militias. In 1942, during the Quit India Movement, the colonial government used, for the first time in its history, air power to strafe nationalist rebels. But even in the middle of this ferocious campaign of repression, there were officers of the colonial state who remembered that they were going after human subjects of the British Empire. One ICS head of a district famously warned his policemen against being trigger-happy: “Remember," said Mr Niblett, ICS, “you’re not on shikar." With paramilitary forces called CoBra (Commando Battalion for Resolute Action), kitted out with mortars, rocket launchers and sniper rifles, for a campaign called Operation Green Hunt, it’s clear that their republican successors haven’t been given the same caution. They’re loaded for bear and print and broadcast journalists who hitch a ride on this armed safari might consider the credibility of their embedded American counterparts who whistled their way in chorus into a criminal war. Mukul Kesavan, a professor of social history at Jamia Millia Islamia, is the author of The Ugliness of the Indian Male and Other Propositions. Mukul is taking a sabbatical from op-ed writing. This is his last column.